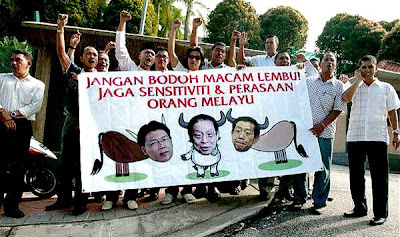 Headless cow gang from Umno portraying DAP leaders as The Yellow Peril or Mooists. Way to go... kick their faces in... show them your utter contempt, boys! Hahaha... pee on Lim Guan Eng... fart on his father's face... do it! They joined a group of men outside the Sessions Court here and displayed a banner of the heads of DAP leaders Lim Kit Siang, Lim Guan Eng and Nga Kor Ming on the bodies of cattle in front of press photographers. 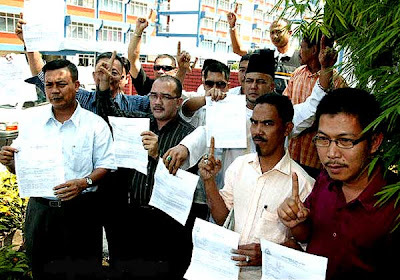 The group told reporters that they would be lodging a police report later today against the DAP for questioning Malay rights. SO WHO'S MORE 'KURANG AJAR' ~ THESE DUMBOS FROM UMNO OR NAMEWEE? 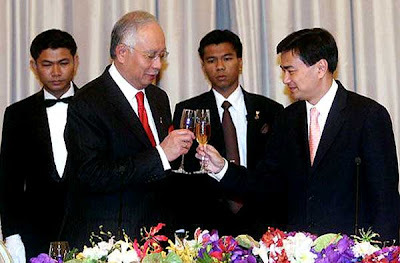 I do wonder what sort of trauma these UMNO fools have been inflicted with to act so bizarrely. None of their arguments have yet to make sense. I'm not holding my breath in expectation for any change in the near future. najis: i drinking grape juice wa ... wat's the big deal? tsk, tsk, tsk! i dun entertain frivolous remarks lah! So what will our learned Minister of Info, Comm & Culture say about these jokers? 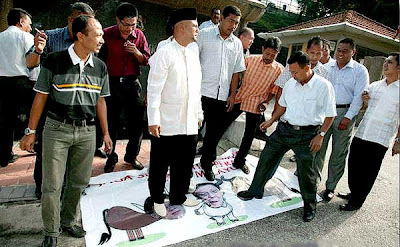 The same as he said about the 3 frogs whose pics were stepped on by the DAP? Who were the parents of these cowhead dumbos? Something must be wrong with them to have brought up some dungus!! 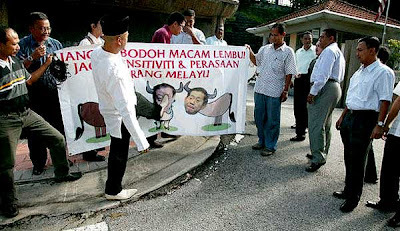 Kepimpinan melalui Teladan - that was one of BN's National Day slogans for one of the Merdeka celebrations! How come Najis is not following this? If he was, then he should offer himself for "public caning" under Islamic law for CONSUMING ALCOHOL!